Maruti Suzuki is one of the top automobile manufacturers in India. Ertiga, from the house of Maruti Suzuki, comes with a Smart Hybrid technology, automatic transmission and SmartPlay Infotainment System. Why is it Important to Insure Your Maruti Suzuki Ertiga? Insuring your Maruti Suzuki Ertiga will ensure that you stay financially protected at the time of a mishap. The car insurance covers the own damage liabilities as well as third-party liabilities at the time of a mishap depending on your insurance plan. Also, as per the Motor Vehicles Act, it is mandatory for every car owner in India to insure his or her car. Royal Sundaram India Insurance Co. Ltd.
*Please note that the above prices are exclusively for Bangalore and are subject to change with respect to the city you purchase the vehicle from. *The above-given table provides the basic engine information and may vary with each vehicle. A comprehensive car insurance gives you an overall financial protection against third-party liabilities and own damage liabilities at the time of a mishap. A third-party liability cover gives you limited financial protection against third-party liabilities alone that you incur due to a mishap. You can visit the insurer’s official website or third-party insurance websites to purchase a new insurance policy or renew your existing insurance policy. You can visit the nearest branch office of the insurer or meet with an insurance agent to avail a car insurance or renew your expired policy. Damage or loss due to man-made calamities, natural calamities, theft of the vehicle, etc. Is it necessary to inform my insurer in case I fit a CNG/LPG kit in my car? Yes, it is vital that you inform your insurer when you install a CNG/LPG kit in your car. What is a voluntary deductible? A voluntary deductible is a part of the insured amount that you opt to pay at the time of claim settlement. Does my geographical location have an impact on my car insurance premium? Yes, your geographical location is one of the factors that determine your car insurance premium. Can I cancel my car insurance policy anytime? Yes, you can cancel your insurance policy anytime provided you haven’t raised any claims 30 days prior to the policy cancellation and you have availed another car insurance policy for which you can provide proof. 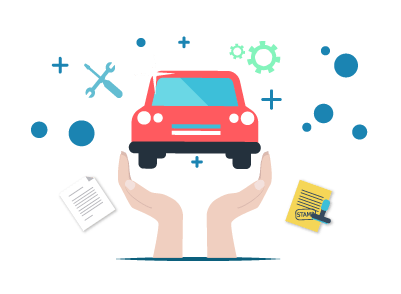 What is a cover note in car insurance? A cover note is a temporary document given to the insured by the insurer until the original insurance policy document can be issued.